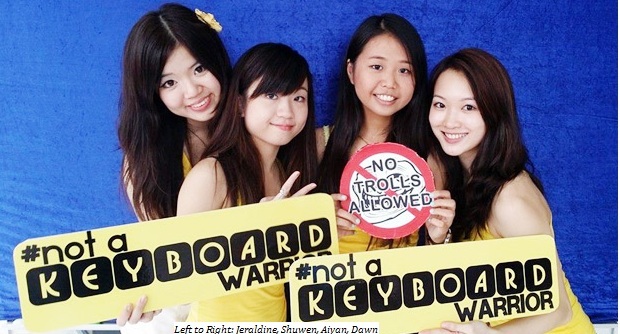 Not A Keyboard Warrior is Singapore’s first ever youth-led campaign to combat cyber-aggression. Led by a team of students from Nanyang Technological University’s Wee Kim Wee School of Communication and Information, the campaign seeks to raise awareness of the growing problem of cyber-harassment in Singapore and to educate youths about the consequences of engaging in such acts. Their finale roadshow held over the last weekend at *SCAPE saw 750 youths showing interest for the cause, and taking pictures to pledge their commitment for online civility and etiquette. “We are very heartened to see so many youths coming forward to state their commitment for this cause. 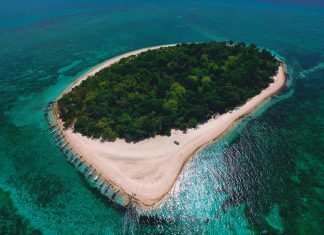 Many of them were also surprised when they learnt that Singapore was ranked amongst the top globally in cyberbullying,” said Kwang Shuwen, a member of Not A Keyboard Warrior’s team. Within less than two months since its launch, the campaign’s Facebook page garnered a total of 800 likes. Their street interview with several Singaporean youths titled, “Are you turning people off with your Facebook Profile?” has gone viral. The campaign is supported by Harley-Davidson of Singapore which also co-produced a series of online advertisements against cyber-aggression in Singapore. “Harley-Davidson has been very active worldwide speaking up against abuse and bullying of children and youth. Together, we hope to bring across the message that youths do not need to put others down to embody qualities like courage, toughness and to stand out from the crowd,” said Dawn Eng, member of Not A Keyboard Warrior. Singapore is currently ranked second highest globally for cyber-bullying (First: China, Third: India). Actions which constitute cyber-harassment include comments made online directed at specific individuals containing personal attacks, derogatory/discriminatory remarks and obscenities. The intentions of such acts are often to threaten the employment, reputation, or safety of the victim by turning other people against them. Aggressors may also actively encourage others to harass the victim. The city state has faced several cyber-harassment cases in the last few months that involved high profile individuals such as 22-year-old man who posted racist comments under the nickname “Heather Chua”, NTU sociology student Lim Jialiang and British expat Anton Casey. According to Dr Carol Soon, research fellow of the Institute of Policy Studies, research has shown that negative behaviour online is an accurate reflection of someone’s behavior offline. She praised the campaign for being a “commendable endeavour”. Cyber- harassment would soon be criminalised in Singapore under the proposed new harassment law which will cover a range of behaviours, such as sexual harassment within and outside the workplace, cyber-bullying and bullying of children. This move is supported by over 80 percent of Singaporeans. “The Internet is not a law-free zone. Laws relating to contempt of court, defamation, religious harmony and sedition apply to online statements just as they do to statements made verbally or in print. Be aware of this, and communicate responsibly,” cautioned Dr Jack Tsen-Ta Lee, Assistant Professor at the Singapore Management University School of Law. Youths who are interested in the cause can show their support against cyber-aggression by liking their Facebook page at www.facebook.com/NotAKeyboardWarrior.